There has been a lot of talk about Quinoa. It first appeared as a food that would put those who ate it in the “Health Nut” camp but has recently become more of a mainstream curiosity. Quinoa (pronounced ‘Keen-wah’) is a funny little food – at first glance people are tempted to call it a “grain” when indeed it is a “seed”. A very small seed and prominent member of the Goosefoot species of plants. I’m sure most of you have fought valiant battles against quinoa relatives who love to pop up in the fertile soil of your garden year after year. Back home we called them ‘ironweeds’ or ‘pigweeds’ or even ‘lambs’ quarters’ and when young they actually make a tasty and nutritious substitute for spinach at the dinner table – but that’s beside the point. Quinoa is an ancient food from Peru and surrounding areas. The Incas considered it to be a sacred crop which caused their new Spanish neighbors to hold quinoa in distain. It was even outlawed for a time and the natives were forced to grow the more European wheat. What the Spanish didn’t know and what we are now finding out is that the Incas had good reason to hold their quinoa dear. Though it be tiny and a relative of plaguing weeds, quinoa has an impressive resume. Full of fiber, magnesium, iron, calcium, as well as being a complete protein in its own right, quinoa is gluten free and easy to digest. It’s also a smart plant, having a built-in defense system which causes it to be distasteful and even gastrically upsetting when eaten before the outer coating has been removed. The crop is easier to protect from critters that would sneak in and steal it before harvest. Most quinoa sold in the grocery stores has already been processed to remove the coating so when you purchase it (which I sincerely hope you do!!) it’s ready to be cooked and enjoyed. How do we enjoy it, you ask? I have read that it can be considered ‘an acceptable substitute for rice’, but other than giving you a good idea of the broad range uses, I don’t think it does quinoa justice. I have found it to be so much more than ‘acceptable’ and so much more than a ‘substitute’! My mom taught me to cook quinoa with a basic ratio of two parts liquid to one part quinoa and I have never had that fail me. Adding one cup of quinoa to two cups of slightly salted boiling water or stock, letting it cook until the water has boiled down to the level of the quinoa (8-10 minutes) and then putting the heat to low and covering it to ‘steam’ for 10 or so minutes more will give you a delightful, 2 cups (roughly) of cooked quinoa to serve plain as a side dish or to use in another recipe. The portions I just described will serve about 4 people. Cooked quinoa is tender but still has a nice texture to it. It isn’t lumpy or soupy or mushy but can be ‘fluffed’ with a fork and the seeds will be separate. Another way you can tell is that the slim white ‘tail’ on each seed becomes loose, giving them an artsy look, as if they are wearing hats adorned with long feathers. Once you have the basic recipe down and are ready to have some fun with it, there is certainly fun to be had! My latest quinoa craving has been satisfied by adding sautéed onions and chopped raw kale to the quinoa as it is cooking. So easy, so healthy, so very delicious. Another favorite method in my house is to start out by sautéing fat slices of sweet leeks in a bit of olive oil before adding chicken stock and then the quinoa. Oh. My. Word. 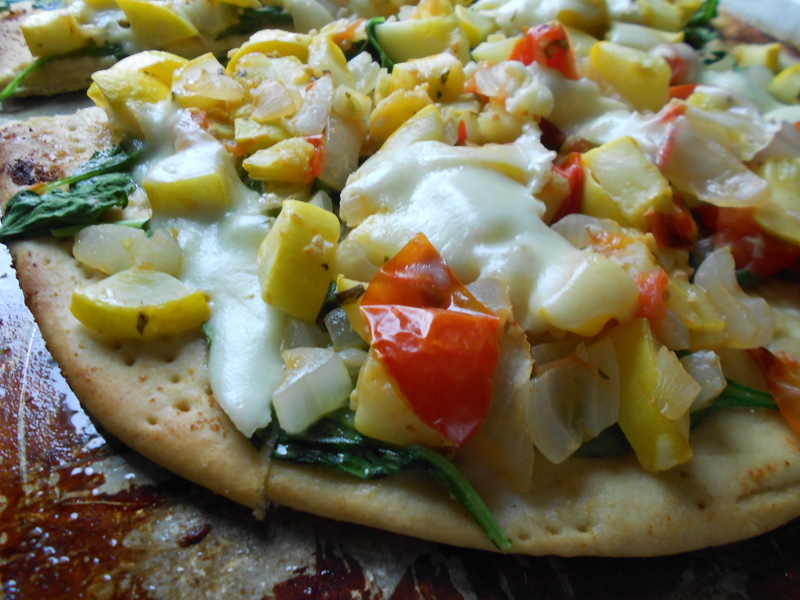 Making flat bread involves a couple more steps than the ones used to make a plain old pizza – but boy is it worth it! I started with the Plain Old Pizza Dough recipe and after letting it rise, I simply rolled it out as flat as I could and placed it on a greased baking sheet. Then, I pricked the surface with a fork – all over – and brushed on some olive oil. After a sprinkling of garlic powder and sea salt, the flat bread went into the oven (preheated to 375 degrees) for about 15 minutes, or until the crust was lightly browned. 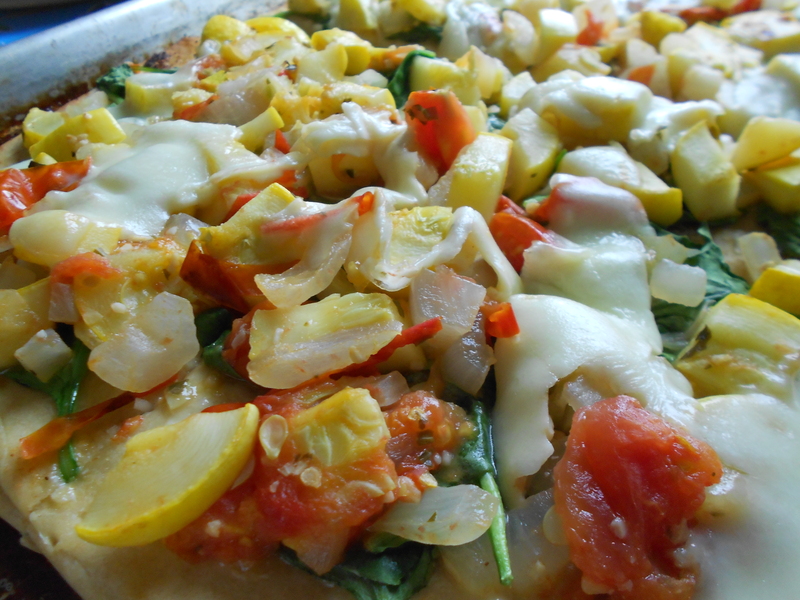 While it was baking, I chopped up and sauteed some onions, sweet red peppers, yellow crooked neck squash, fresh tomatoes, garlic and spinach. 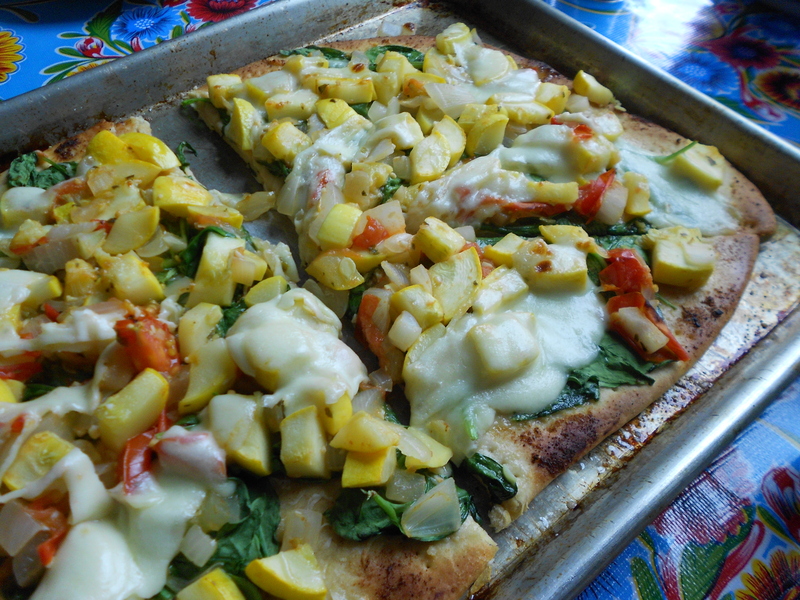 When the crust came out of the oven, the veggies got spread around on top and then lightly blanketed with slices of fresh mozzarella. I turned the oven onto Broil and popped the whole thing back in the oven for another five minutes or so, just until the cheese had melted and begun to bubble. Incredible, I say. 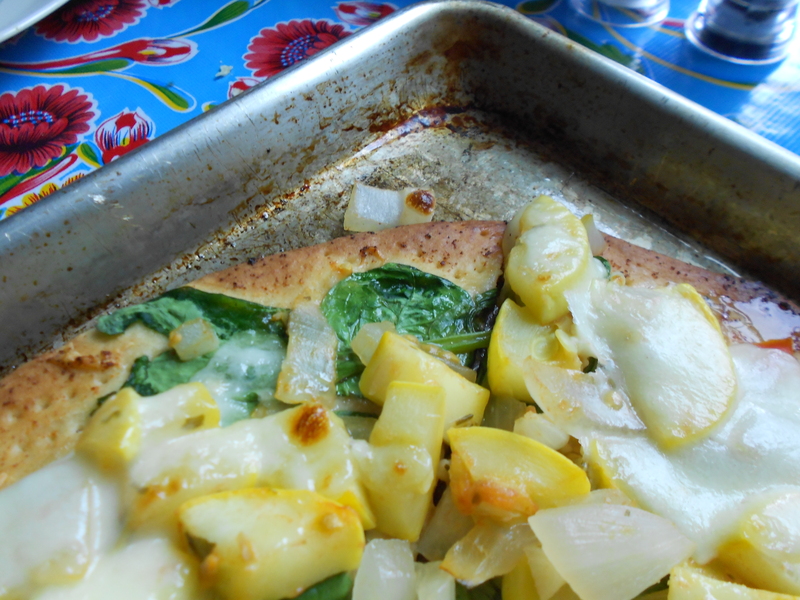 The crust was thin and firm and the veggies were tasty mellow and the whole thing was garlicky and cheesy and yet rather healthy and quick, especially if you make the dough ahead of time. This meal is definitely going to be repeated in the near future!